I am a conservation biologist with an interest in describing and better understanding the interactions between wildlife and agriculture/urban systems. 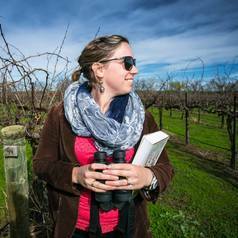 In this context, I currently run a field research program to assess how farms in California can be made more bird-friendly, and whether bird-friendly management practices lead to better pest-control services, or conversely, more crop damage, by the birds they attract. I am currently a David H. Smith Conservation Research Postdoctoral Fellow, and in that capacity I also work on projects with my Smith Fellow colleagues to use our training and scientific knowledge to affect change in fields related to Conservation Biology.